Summary: I did this walk in the company of my brother Dave the day after we had climbed Scafell Pike in lovely weather. The first part of the walk was done in atrocious conditions and we never got to see much of Grey Knotts or Brandreth at all. Mercifully after that the skies cleared and we scaled Fleetwith Pike we did some surveying of the slate mining on the mountain while up there. The weather was grim indeed and our plans of an exciting ramble on the high ground above Honister Hause was quashed. The original plan had been to climb to Grey Knotts and Brandreth and then head for Great Round How and Blackbeck Tarn before skirting the south face of Fleetwith Pike via Warnscale Beck and Warnscale Bottom before arriving at Gatesgarth Cottage for a lunch break. 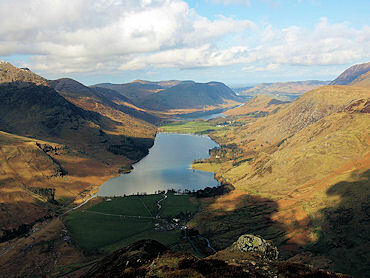 After that the intention was to ascend Fleetwith Pike from the west via Low Raven Crag and Fleetwith Edge to the summit before descending with pleasure back to Honister Hause. Despite the inclement conditions (it was pouring down) we pressed on in the hope of better weather further on and followed the track south from Honister Hause to Grey Knotts. The going was steady, a constant ascent and with no view above 20 metres in front it was a case of head down and keep climbing. We couldn't get lost as we followed a line of fencepost's all the way up. With that security I do recall time passed by quickly and we soon reached the summit of Grey Knotts. 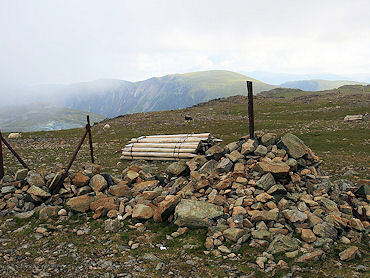 The view from the summit, according to Wainwright is spectacular. He states "The view is good on all sides, with a skyline of giants to the south and a finer view to the northwest of the Buttermere district, seen over a foreground of rock, is of superlative beauty" Alas we saw nothing but grey murk. We pressed on the Brandreth and soon got there as there is no discernible climbing between the two peaks. At least we could revel in Wainwright's dismal description of the summit, quote "a bare and cheerless place, a desert of stones with nothing of interest" Despite his words and our melancholy we were at the highest point of the days walk and we rested. As we did there was a glimmer of hope, the rain began to cease. Dave and I were wet through but at least we could look forward to a drier continuation of the walk. At height we were still in cloud so we began a hasty descent after fueling ourselves but the plan of that longer trip to Fleetwith Pike had been abandoned while we took our food break atop Brandreth. We took a bearing at the meeting of paths at NY213123 and took a direct line to Hopper Quarry. Halfway to the quarry we came below cloud and at last could see a decent distance in front of us. Phew, a relief and we then relaxed to investigate the disused quarry before following quarry roads and then mountain ridge westward to the summit cairn. 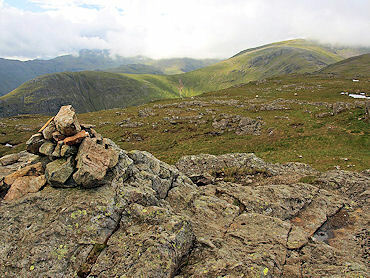 We bounded atop the mountain as we had completed our mission despite the elements conspiring against us and from the summit we leisurely walked back to Black Scar and then Bell Crags while investigating more cuttings and and slate workings on the mountain. Dave, the artist he is made shapes from discarded slate and left them for other walkers to view. I wonder how many people took in the art before destroying the work. 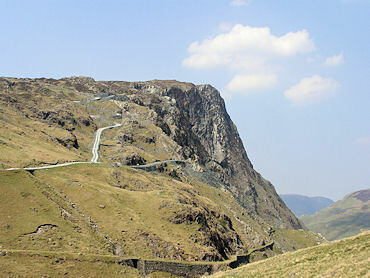 Soon after we were down and took to the Honister Hause cafe for a welcome hot drink. We were done and three Wainwright's accomplished without exactly seeing the best of them. Perhaps we will return on a better day.